The Egyptian Minister for Irrigation and Water Resources Muhammad al Din Allam has revealed that in light of the inability to traverse the disagreement with Ethiopia, Egypt has decided to call for the intervention of international bodies to settle their winding dispute. On January 4th, water ministers and experts from Sudan, Ethiopia and Egypt met in Khartoum in an attempt to find a solution to the long-standing dispute over the construction of Ethiopia’s Grand Renaissance Dam on the Nile. Although officials had expressed optimism that a solution, which satisfied all the parties involved in the dispute, was in sight shortly after the meeting, hopes of a quick resolution to the impasse were dashed when Egyptian authorities revealed that they are not planning to attend the next meeting between ministers from the three nations in Khartoum next month. The Egyptian Irrigation and Water Resources Minister has disclosed that Egypt is set to embark on an international protest against the construction of the Grand Ethiopian Renaissance Dam. He further noted that Egypt will officially lodge a complaint with the United Nations Security Council and other relevant international authorities over the dam. Ethiopian and Egyptian authorities have been at loggerheads over the dam since its constructors began diverting water from the Blue Nile as part of the dam’s construction in 2011. Besides concerns over the dam’s impact on the water supply of Egypt, Egyptian officials have also raised alarm that studies into the impact of the dam on the environment have been insufficient, given its size. Meanwhile, the three nations have not been able to agree on the composition of a committee to effect the recommendations of a panel of international experts assigned to study the dam last year. While the dam has been a source of distrust between Egyptian and Ethiopian officials, several Ethiopians have hailed the initiative, which is set to provide electricity for a country where over 50% of the population lack reliable power supply. Ethiopian authorities continue to underscore the regional significance of the $4.2 billion dam, which will be the largest hydro-electrical plant in Africa when it is completed in 2017. But Egyptian authorities say the dam unquestionably poses a threat to Egypt’s water supply, noting that it will require about 60 billion cubic meters of water to be filled. As an alternative solution, several Egyptian pundits have called on their government to seek alternative sources of fresh water supply for the arid nation, besides the fabled Nile. 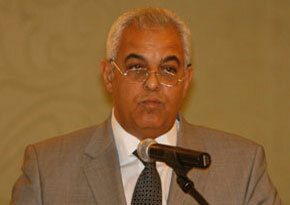 Photo: The Egyptian Minister for Irrigation and Water Resources, Muhammad al Din Allam.